Adam Griggs’ side will face the world’s fifth-ranked team the day after Ireland’s men host the All Blacks. 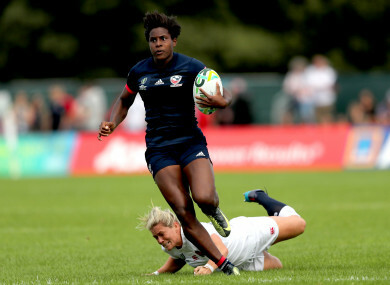 Naya Tapper makes a break against England during last year's World Cup. FOR THE THIRD year out of four, Ireland Women will play November Test matches with the USA confirmed for a clash Donnybrook. The Eagles, who finished fourth at last year’s World Cup in Ireland, host New Zealand’s Black Ferns in Soldier Field, Chicago, the same day as Ireland’s senior men face Italy (3 November). They will then travel to Dublin to face Adam Griggs’ side a fortnight later. The match is set for Sunday 18 November, the day after Ireland’s men host the All Blacks in the Aviva Stadium. In the wake of the home Women’s World Cup last year, Ireland did not play November internationals. They played their first ever November Test against England in November 2015 and played three further matches against England, Canada and New Zealand in 2016. Email “November Tests return for Ireland Women with USA set to visit Dublin”. Feedback on “November Tests return for Ireland Women with USA set to visit Dublin”.